And this coming from the president of the unofficial Melky Cabrera fan club. So the Yankees have addressed a need, upgrading their weakest (offensive) position, without giving up any key players from the major League roster. 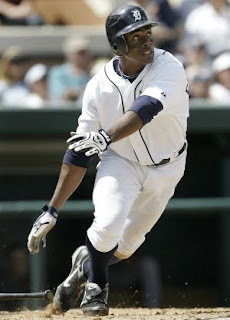 Yes, they did trade highly-touted AAA CF Austin Jackson, but his greatest upside might be the known quantity they just acquired...Curtis Granderson. Granderson is a better-than-average center fielder and a force in the lineup. This past year his average dipped to .249 but he still manged 30 HR and 20 SB. I lived in Michigan in 2007, and got to watch CG on a day-in, day-out basis. He had one of the best offensive years I can recall. As a leadoff man, he hit .302 with 122 Runs scored and was 26-for-27 stealing. That alone would have been enough, but throw in 38 doubles, 23 triples, and 23 HR. Granderson was a legitimate MVP threat until the pitching blew up, and the Tigers gave up 1st place in their division with a 31-38 finish. Is Jorge Posada a Catcher or a DH? If he's still a Catcher, then you simply move Melky Cabrera to LF. Then you make the call which World Series hero you cut ties to, Johnny Damon or Hideki Matsui. They're both leaders, they're both clutch, they can both still contribute at the plate, and they're both awful outfielders. If Posada's a DH, then you'll need to cut ties to both Damon and Matsui. And you either hope that Jose Molina and Francisco Cervelli can do the job without being a complete hole in the lineup, or you'll need to get another backstop. Either way, the offensive upgrade you get from Granderson is negated in this scenario. I personally think Posada is now a DH, so the Yanks may have just begun to re-tool. Next question - who bats leadoff? Granderson is a career leadoff hitter. But the Captain, Derek Jeter, probably feels pretty comfortable in that spot. This is why baseball still has year-round appeal more than any other sport.